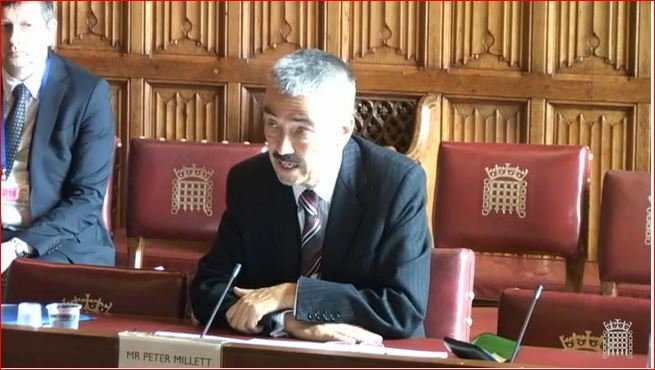 Britain’s ambassador to Libya Peter Millett reported on Libya to the House of Lords last week (Photo: Parliament TV). 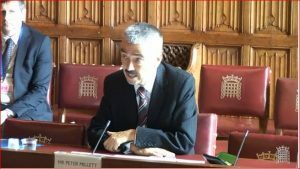 Speaking for just under an hour to a House of Lords Committee, Britain’s Ambassador to Libya Peter Millett said that he had been ”very closely involved” with the 2015 UN-brokered Libyan Political Agreement (LPA). He revealed in answer to a series of questions to committee last week that he had visited Tripoli five times and that he had stayed overnight on his last visit. He said that the British embassy’s presence was currently only in Tripoli for the time being but hoped to” expand its presence”. One or two British embassy representatives would be in Tripoli ”every week” from now, but would not give a date for the reopening of the embassy. On security, Millett said that Tripoli was calm and that the Presidency Council (PC)/Government of National Accord’s (GNA) ministers had started to operate from their ministries. He said that most of the Tripoli based militias were ”accepting and welcoming” of the LPA. ”The security situation was not good”, Millett admitted. The GNA was trying to bring different militias under one unified command, he explained, adding that it was going to be difficult to achieve due to regional variations, but that ”it was a work in progress”. On the tensions between the House of Representatives (HoR) and the PC/GNA, Millett underlined that under the LPA, the HoR had the sole legislative role but that the HoR had endorsed the GNA in principle in January but had not voted on the GNA. However, he added that a majority of HoR members had announced their support for the GNA. Millett said that HoR president Ageela Saleh has not been prepared to organize a formal vote but that the international community recognizes the GNA under UN Security Council resolution 2259 as the sole legitimate government. Asked about the relationship between the HoR’s Libyan National Army (LNA) chief Khalifa Hafter and the GNA’s Defence Minister Barghathi, Millett said that ”their relationship was not good”. He said that although Barghathi, who he described as ”a credible figure”, was from the east and from the LNA which Hafter leads, Hafter was ”not accepting” him as Minister of Defence. Millett said that the LNA had been reasonably successful in the east in removing extremists from Benghazi, but said that its future structure was unclear as it will be based on personal relationships. Currently, it is the nine-man PC that is the supreme armed forces commander, not the HoR’s Ageela Salah who refuses to give up the role, he explained. On Libya’s current cash shortage problem, Millett confirmed the Central Bank of Libya (CBL) had confirmed that there is LD 24 bn of notes in circulation which in per capita terms equates to twice that in circulation in the USA. Millett confirmed that British money printers, De La Rue had recently supplied LD 1 bn that was pumped into the system. He added that tackling the cash shortage problem was” not an issue of printing money” but an interlinked issue of ”building confidence and security” and regenerating the economy. Libya needs economic reform, including increased oil production, the opening of Letters of Credit for imports. Asked if there were any tensions between the PC/GNA and Operation Sophia, Millett said that there was a 7-person Libyan committee to liaise with Operation Sophia and the deal to train the Libyan Coast Guard which it is hoped would prevent illegal migrants from leaving the Libyan coast heading to Europe through the central Mediterranean. He stressed that Operation Sophia was operating outside Libyan territorial waters. On IS, there had been ”rapid progress” against it in Sirte which had been forced into a ”very small area of Sirte”. Millett said he was unclear regarding the numbers or identities of IS in Sirte. He thought the states numbers of 5,000 to 6,000 are too high and that their ‘’capability was not as great as thought’’. Millett said that ‘’rapid movement by the Misratan militias’’ has squeezed IS into the centre of the city. He said it was not clear if the lower numbers of IS in Sirte were because IS had left and ”dispersed” within Libya. If so, he admitted that this would now ”pose a different type of threat”. He said that IS enjoyed very little local Libyan support and that it got its support from regional countries such as Tunisia and Boko Haram. They had occupied Sirte because it was Qaddafi’s and consequently it was ignored by the various Libyan governments since 2011. The Libyan public was not embracing IS as we have seen in other countries. Looking forward on the situation in Sirte and IS, Millet said that there is a debate in Libya as to whether to ‘’finish them off’’ or hold off and see. He said 250 had died and 900 were wounded in the Sirte battle, mainly from Misrata. He said IS were ‘’weakened and on the back foot’’. The Misratan militias fighting IS fall under the operations room organized by the GNA and that they had ‘’pledged loyalty’’ to the GNA. The Petroleum Facilities Guard (PFG) fighting IS from the eastern front were also under the GNA Ministry of Defence, he added and that the next step is to unify command in the eastern oilfields. On the regional ramifications, Millett said that the Tunisians that had carried out the terror attacks in Tunisia were trained and armed in Libya. Libya’s southern border, he added, was enormous and much more difficult to evaluate as it was wide open territory where criminal gangs were involved in weapons, drugs and other illicit goods. He thought that the number of Libyan refugees in Tunisia were lower than the 1.2 million often stated by Tunisia and added that many drove around in good cars and did not look like refugees. Millett admitted that there was debate over the imposition of EU sanctions on key Libyan figures who did not plan to travel or had assets abroad, yet added that the international community could not stand by and allow people to ”flaunt international law”. He recalled that EU sanctions had been imposed on the HoR president Ageela Salah, Salvation Government Prime Minister Ghwel and GNC president Nuri Abusahmain, adding that the GNC had virtually disappeared. Millett noted that the ”threat of the use of sanctions” was a useful tool and more effective than actual sanctions. The circulation of names in the media had changed people’s behaviour. On unfreezing Libyan assets abroad, Millett said that the CBL still had significant assets, noting that it had about US$ 100 bn in reserves which are down to around LD 50 bn. This was due to the fall in state revenues due to a fall in oil production and crude oil prices. Millett said that the advice that the PC/GNA was getting was that it should not touch Libya’s long term overseas investment assets but to use existing reserves and at the same time increase oil production. If the GNA wants to use its frozen assets, however, it must make a request for them to be unfrozen. However, he added that the request to unfreeze assets must be clearly attached to a plan as how they were going to be used. It needed to be a specific report for a specific amount for specific use or project, adding that the international community was ”open to such a request”. The priority is to plan and increase oil production which is less than 200,000 barrels per day down from 1.5 million bpd, adding that production could be increased with a little bit of maintenance to 700,000 bpd within months. Millett, however, admitted that the ”obstacles to increased oil production were politica”l (and not technical or administrative), asking ‘’are people in control of pipelines ready to permit it…and at what price’’. Asked by a member of the committee if in view of the fact that Arabs like strong leader whether GNA Prime Minister-elect Faiez Serraj was a strong enough leader and that the international community caused the problems in Libya by removing the strong leader (Qaddafi), Millett defended Serraj. ‘’I do believe Serraj is succeeding. He knows where he wants to go. There is slow progress to win confidence. It is slower than we would have liked’’. Adding that ‘’changing horse now would not be the right thing’’, Millett concluded. Asked if there were sufficient ”unifying ideas to keep Libya together, Millett admitted it was a long term challenge as Libyans identified with family, tribe, city and region and that national identities did not exist at the moment. It will take quite a while, he added.